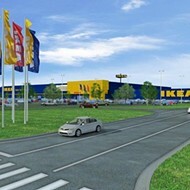 Construction on the first IKEA store in Tennessee has begun, starting this morning with a celebratory ground-breaking at the site. When completed, the store will be 271,000 square feet and employ 225 workers. The store, which will be the 43rd in the United States, is slated to open in fall 2016. It will have over 10,000 items for sale, three model home interiors, 50 room settings, a supervised children's play area, and a 300-seat restaurant serving Swedish fare. The store also will feature a "Children's IKEA" area, baby care rooms, and play areas to really bolster its family-friendly atmosphere. The company's road to construction was initially delayed through issues with the Shelby County Assessor Cheyenne Johnson, who re-evaluated the property IKEA now occupies as being $1.2 million more than originally thought. However, since a tax break deal with the Economic Development Growth Engine (EDGE), the company has moved forward with the construction and planning of the new store. The store will be built in Wolfchase, on the southwestern side of Interstate 40, near the Germantown Parkway exit.